This summer I've been working my way through the books of Haruki Murakami and loving each one of them. Starting with The Wind Up Bird Chronicle, then Kafka on the Shore, I next churned through the 1100+ pages of 1Q84. Now, with September coming on, I'm still going with Hard-Boiled Wonderland and the End of the World, as the man has a serious back catalog of work published and just released another book last month. Something I love are all the little details he includes about his characters' meals, from business lunches of seafood linguini to a late night drink accompanied by a bowl of pistachios. Granted, food doesn't hold the central place that classical music or western literature has in his dreamlike, open-ended, and suddenly violent stories, but it's always there in the background coloring in the scenes. A few times a character eats salted, dried horse mackerel, which is a food I was unfamiliar with before these books. I assumed it was a fully dried fish that was reconstituted in water or broth for a soup. 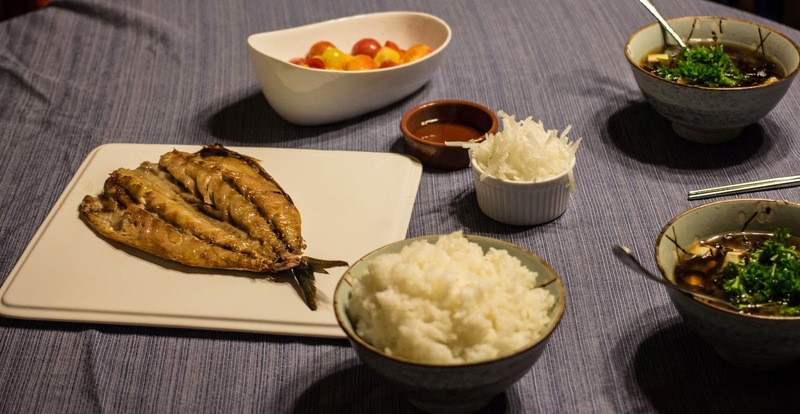 But it's actually a semi-cured, air-dried fish that gets grilled gently on both sides and is served whole, with rice, miso soup with tofu, grated daikon radish, and a green salad. At least that's how Murakami's characters normally enjoy it. One YouTube video mentioned this dish, being only semi-cured, is normally stored frozen until use. But I haven't found it in any local Asian grocers. So I decided to make it myself. I've never seen horse mackerel before, but we can get plenty of fresh Spanish mackerel here in Pennsylvania. Information on making this at home was sparse, but I did find one site in particular that helped. But I was perplexed by the idea that the fish would be dried in the sun. My brother has sent me photos of white fleshed fish drying in sun in Korea, but wouldn't the fat in oily mackerel go rancid? The above site did say you could dry it at night, which seems safer to me (and would have cooler temperatures.) So I rubbed two Spanish mackerels with sea salt. To prep the fish I headed, gutted, and took out the spines so they could lay flat like an open book. Well-salted, I rubbed the outsides in salt, then wrapped them in large pieces of kombu kelp. Curing fish with kelp was something I gleaned from Morimoto's cook book, and a step I added as I tried to figure this dish out. 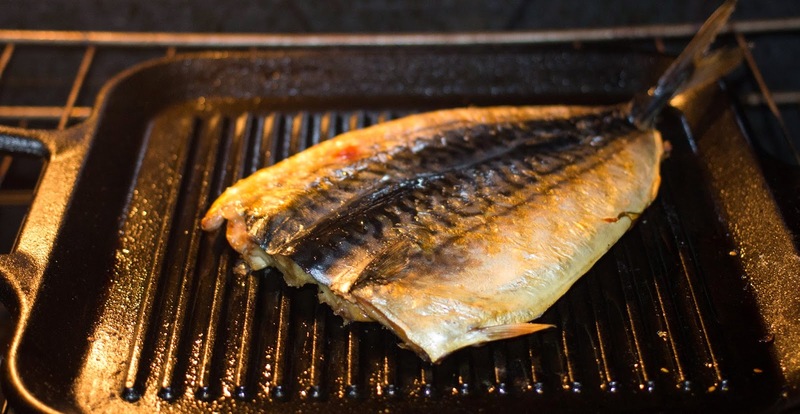 I let the mackerel cure overnight in the fridge, which gave me a break to figure out the next steps on how to dry it. Some people just dry it outside, hanging inside a porch, but I think our neighbor's cats would think it was a treat for them. Assuming the possums didn't get it first...or the porcupine that's taken up residence in our woods. But do porcupines eat Japanese food? Ultimately, I decided to jury-rig up an improvised fish dryer. 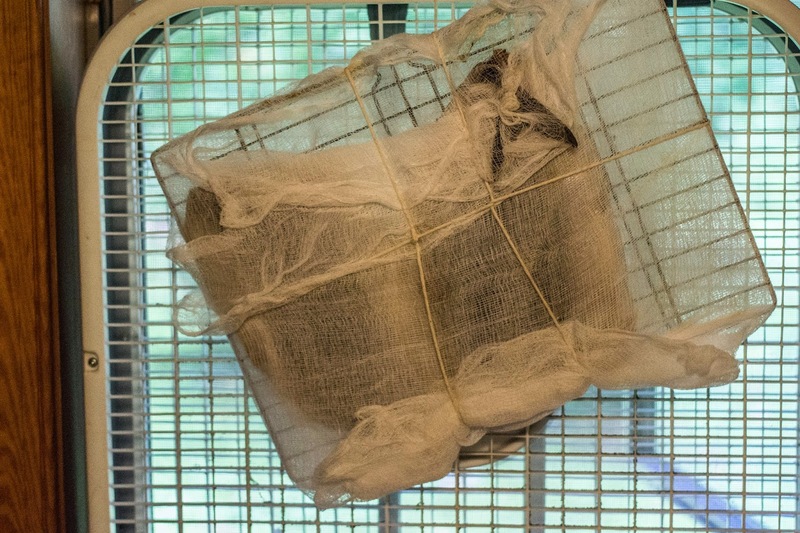 I blotted the excess juices off the salted fish, wrapped them in cheese cloth, and then wrapped and tied the cheese cloth to a metal baking rack. This was then lashed up to a box fan, set up in a window. This might not be how things were done in the Edo period, but it seemed to work. The fan blew air through the fish overnight, giving our hallway a peculiar smell and resulting in a nicely dried piece of mackerel. The flesh felt firm and dry, but still a bit plump. It wasn't totally desiccated or jerky-like. One of these I froze to eat later on, and the second I refrigerated for dinner later that night. From what I gleaned, cooking was pretty simple. 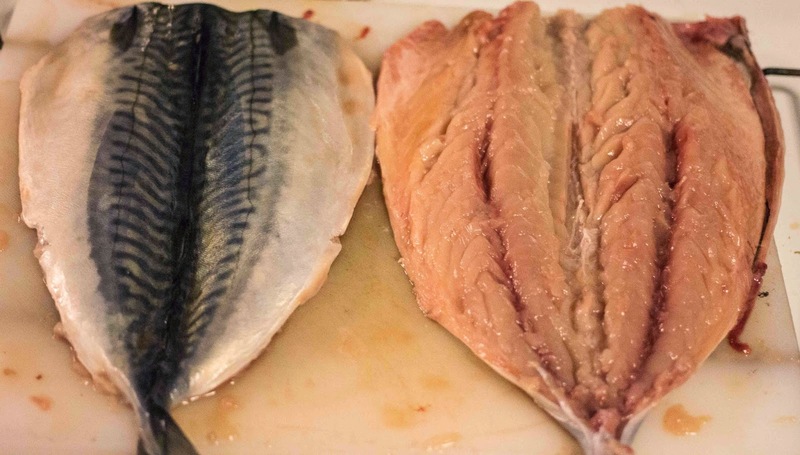 Grill the mackerel on the skin side for about 3-4 minutes, flip over and grill the flesh for another 2 minutes, then flip and crisp up the skin for about 30 sec. After grilling, the fish was sizzling and only slightly strong smelling...which is pretty amazing considering everything it had been through. It was firm, and a bit gummy in texture, but not in a squishy way. 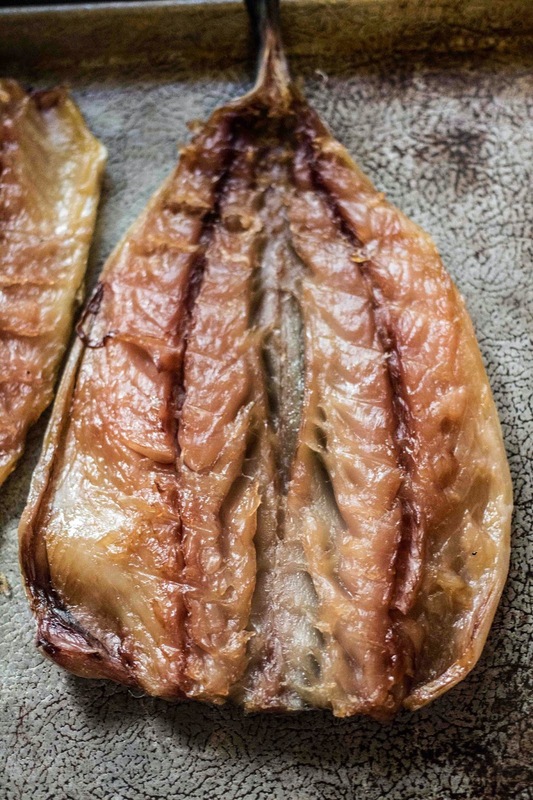 It seemed like the individual muscles, rather than being flaky as in fresh fish, fused together during the curing and drying, creating firm little individual morsels of fish. 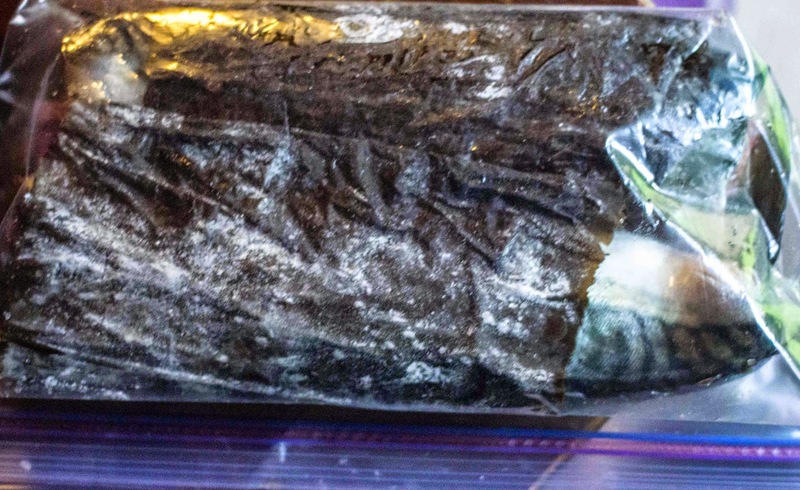 The taste was incredibly savory, which was probably a combination of the curing, kombu (naturally rich in MSG), drying, and intense heat of the grill. I'm excited to eat my second fillet at another meal, but I don't see this as something I'll do regularly. It totally makes sense to do, if you have a glut of fish that needs to be put up before it spoils, but just doing a few fillets at a time seems a bit labor intensive, especially when you could just enjoy the fish fresh.